Choosing the right bi-fold doors for your renovation project can be both exciting and overwhelming. You’ve got a grand vision for your new space and a lot of questions about products, materials and styles. Although your contractor may make suggestions as to which material or brand to use, ultimately the final decision is up to you. Bi-fold doors come in a range of sizes, glass types, colours and materials such as PVC, timber and aluminium. One of the most important factors to consider when selecting the right bi-fold doors is which material to use for your project. Your contractor will most likely present you with a number of options, so it is important to know the strengths and weaknesses of each before making a decision. When making your selection, you should note that not all of these materials are created equal. In fact, each of these materials has different properties which help to determine their price point. Although it may be tempting to select the most inexpensive option initially, purchasing a high quality aluminium bi-fold door is well worth the initial investment. To find out why we think they’re the right bi-fold doors choice, let’s take a look at each material up close. If price is your main determining factor, PVC may seem like the most economical option upfront. However, cheaper is not always better in the long run. Especially when selecting a bi-fold door for a property that must withstand changes in weather and provide a sense of safety and security for your family. PVC or vinyl, as many people know it, is a relatively new material and was developed as an inexpensive alternative to timber and aluminium bi-fold doors. Many homeowners choose this material because of its low cost, wide range of colour choices and ease of maintenance. However, what most homeowners are not aware of is that the most apparent benefits of PVC come at a very steep price. Although PVC may seem like a great value compared to aluminium bi-fold doors, they may not be the best option if you are looking for a product suitable for long term use. PVC is a petroleum based product that may be toxic to your health and the environment. As such materials are known to give off higher amounts of VOC’s, also known as volatile organic compounds. These same compounds are found in the plastic water bottles that we have been told not drink out of due to their toxicity. Another factor that you may want to consider when making your decision is how the material holds up in the event of a fire or other emergency. You may not be aware of this, but PVC is known to give off extremely toxic fumes when burning and can cause even more damage to a person attempting to exit a building during a fire. While PVC is a beautiful product that holds up well to the elements, is easy to maintain and cost effective, it may be worth it to invest in a higher quality material. One that it safer for your home or work environment such as timber or aluminium bi-fold doors. Timber is one of the oldest building materials known to man. It is all natural, non-toxic and a high quality, timber door can last literally hundreds of years. Many timber products come from FSC certified forests which means that they are harvested from forests that are responsibly managed and farmed. Wood that comes from an FSC certified forest is replaced with new growth for future use. Although more expensive than PVC, selecting timber for your bi-fold doors can greatly elevate the look of your project. it may also help to create an ambiance that is warm, welcoming and even rustic. While timber is a better option than PVC, it may not be the best overall solution for you. Unfortunately, only about 8% of all timber products for windows and doors come from FSC certified forests. Because doors require wood that can withstand the elements and last longer, a good portion of this wood comes from mature growth forests. It can take many years to replace a hardwood forest that has been clear cut and mature growth can take up to seventy years or more to replace. Aside from the environmental impact, timber is also harder to maintain than aluminium and may not be the right bi-fold doors if they will be exposed to outside elements. Timber requires periodic painting or staining in order to maintain its appearance. Fluctuations in temperature and rain can warp and damage wood. In fact, many companies who do offer wood bi-fold doors will often suggest using aluminium cladding on the exterior to help extend the life of the product. Aluminum is becoming the material of choice for many bi-fold door installers because it is both practical and extremely versatile. 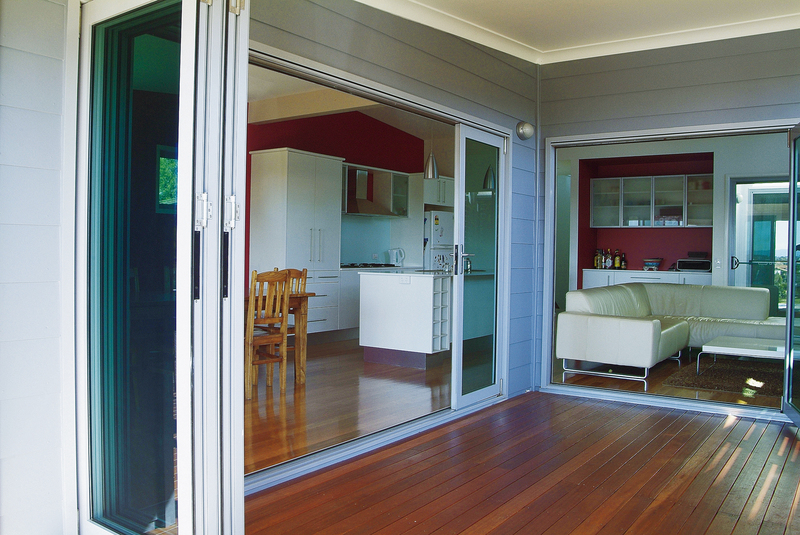 The benefits of selecting aluminium bi-fold doors for your next project are numerous. Aluminium has been shown to withstand years of use because it is strong and won’t warp, bend or stretch like PVC or wood. And like PVC, aluminium bi-fold doors also come in a wide range of colours. The difference? Aluminium bi-fold doors won’t fade with fluctuations in weather or exposure to sunlight. Not only are aluminium bi-fold doors able to support larger panels, they also come in a variety of sizes. For a more elevated look in your home or business, choose the smaller 45 mm frames. These create slimmer more delicate lines and provide for a smaller stacking space that elevates the quality of your design. With their slim, sleek and modern lines, wide range of colours and finishes and versatility aluminium bi-fold doors make an elegant addition to any renovation project. Aluminium bi-fold doors have been proven to outperform wood and PVC and truly make a lasting impression. Selecting premium quality aluminium frames may cost more initially but, the savings on maintenance and repair will make up for it in the long run. Interested in learning more? Come and visit us in the showroom to touch and feel our in-house manufactured products. Or Get in touch with the experts at BetaView today!